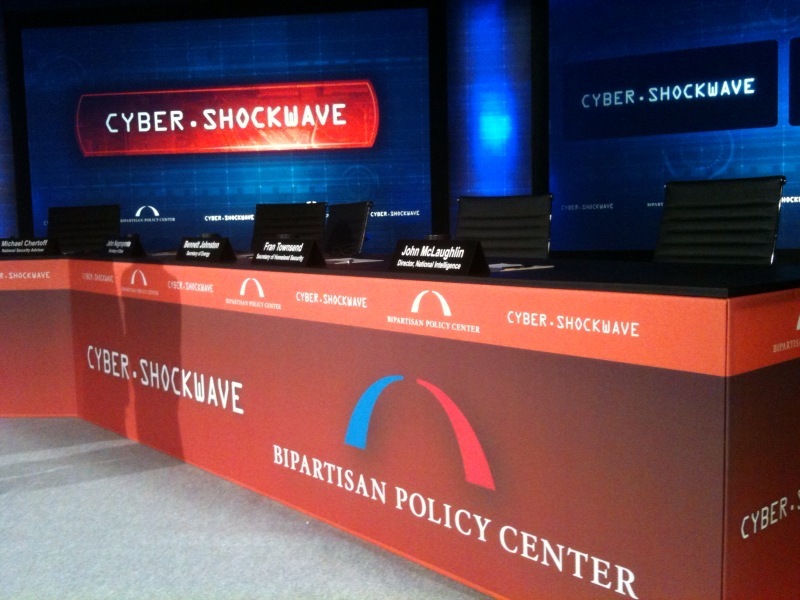 A project of the Bipartison Policy Center (http://bipartisanpolicy.org/events/cyber2010), the event was produced by Chris Wayne and Associates. The simulation featured dramatized Global News Network video reports, graphic animations and innovative video display created by Futureview, Inc. under the direction of David Hanrahan. 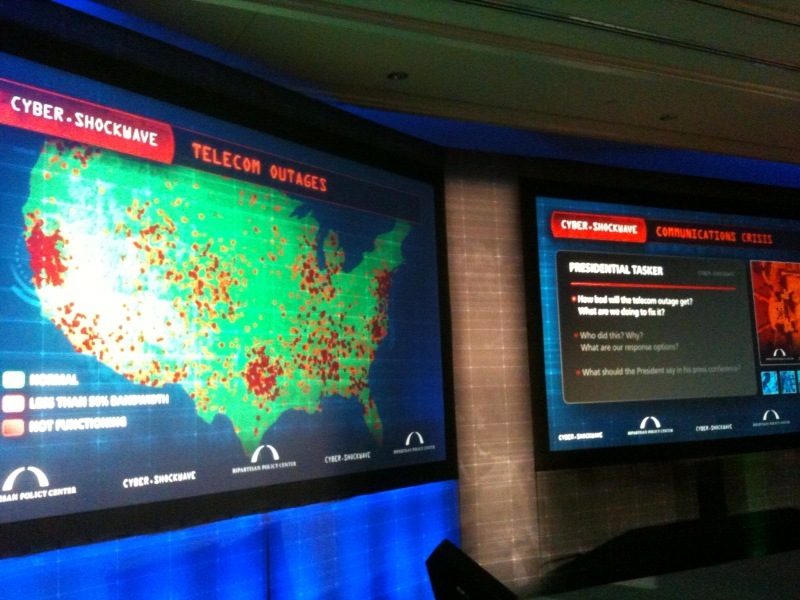 All of these elements were carefully integrated into the video enhanced “war room” to create a simulated cyber terrorism attack on the United States. Events for Change Associate Producer, Danny Huebsch, served as Technical Director for the event and created a beautiful set using scenic materials produced from re-cycled product created by our new joint venture sustainable printing company. 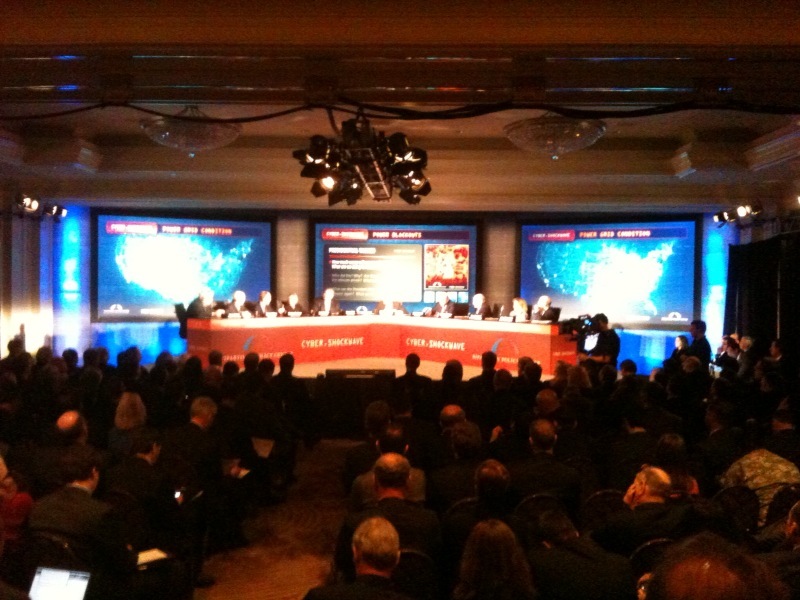 A distinguished panel or “cabinet,” played the role of the National Security Council preparing a real-time briefing to the President of the United States. The cabinet included recent Secretary of Homeland Security Michael Chertoff as the faux National Security Advisor, former Director of National Intelligence John Negroponte as Secretary of State, and retired Sen. J. Bennett Johnston as secretary of energy among others. The event presented the scenario of a March Madness smartphone application that spreads a virus through users’ contact lists until the nation’s cellular networks are overloaded and shut down. This development, in turn, overloads the land line phone system, the Internet and finally, the power grid. As new updated reports come into the panel, they debate the implications to national defense, financial institutions, domestic violence, health care, transportation information privacy and public confidence. The consensus take-away from the exercise was that we are not adequately prepared to deal with this all-to-real possibility. Just another thing to stay up late worrying about—or something else to act on and change. The widespread exposure of this event is certainly a step in that direction.